This class is geared for those 12 - 15 years old who are Green Belt to Black Belt. These students have surpassed a beginner level of Taekwondo and are challenged with a class that is highly motivating and fast-paced. The energy in this class is high and these students work towards superior skills. 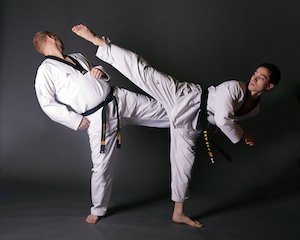 These students achieve goals and overcome challenges in life by remembering their teachings in Taekwondo. This class is high energy and fun for our adolescent students. A highly interactive class that motivates students to strive to be their best. This program instills confidence in a somewhat challenging age group so that they can rise above peer pressure and work towards higher goals. The training is very challenging and the rewards are even greater.